Over 31,000 tons (28,100 tonnes) of plastic, paper, metals and glass were recycled by 77 municipalities in Western Massachusetts during 2011, raising more than $1.4 million in payments for the recyclables delivered. According to the Massachusetts Department of Environmental Protection (MassDEP), the recyclables were processed at its own Springfield Materials Recycling Facility (MRF), which is operated by Waste Management Recycle America (WMRA). In 2011 empty non-hazardous aerosol cans and clear plastic clamshell packaging were added to the list of products that residents could send for recycling at the plant. Once the sorted recyclable materials are sold to end markets, where the department said they are made into products such as hardcover book board, game boards, new metal cans, polyester fibre from plastic bottles and even new recycling bins. MassDEP said that communities receive a flat payment of $15.67 per ton (907 kg) of recyclables delivered to the MRF. In addition, they also receive a revenue share when the markets buying the recycled feedstock are good. 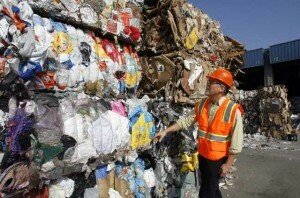 Due to positive market conditions in 2011, the department said that the participating municipalities received $1.4 million from the MRF operator for the recyclables collected last year. In addition, MassDEP estimated that the avoided disposal costs saved by municipalities was approximately $2 million. “Diverting these materials minimises the energy used for extraction of resources necessary to produce the plastic, metal and paper we use every day, and provides real environmental benefits to Massachusetts residents,” commented Energy and Environmental Affairs Secretary Richard K. Sullivan, Jr., whose office includes MassDEP.